Quicks provides equipment, archery sets and bulk orders for clubs, schools, corporate activities and other leisure interests. Please call our main line or contact us with your requirements and we can provide advice, suggestions and quotes to suit your requirements. From complete, basic sets to novel targets and top spec bows, or just a resupply of target faces, we are happy to help. Archery is a superbly inclusive sport. Anyone can have a go and enjoy it and it’s a sport you can do all year round (many clubs have indoor options in the winter). Archery is also a sport that is not hard to pick up, making it suitable for corporate activities or activity centres and general recreation. Of course accuracy and excellence in the sport will take a good deal of practice and focus. Archery is becoming an increasingly popular sport in schools, colleges and universities as it offers something different to the traditional sports available. 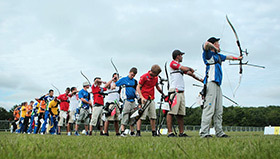 There is information on Archery GB’s website as to how to set up a club at your school or university if there isn’t one yet formed. You can always call us at Quicks for guidance on what equipment you might need to get your archery club started.